This is a traditional Swedish smörgåstårta made vegan. It’s the perfect vegan Easter brunch dish. You only need to make one of these, brew a pot of tea and offer something sweet to end the meal with. The smörgåstårta is basically a giant layered sandwich covered in a sour cream cheese and decorated to the hilt with edible decorations. Make the cake the day before you serve it so it has some time to set in the fridge, before you decorate it. Also it becomes more flavorful and smooth with letting the fillings set in to the bread in the fridge overnight. Add all the ingredients to a food processor, blend thoroughly. Taste and add more salt, if preferred. Build your cake, by layering bread with the fillings. 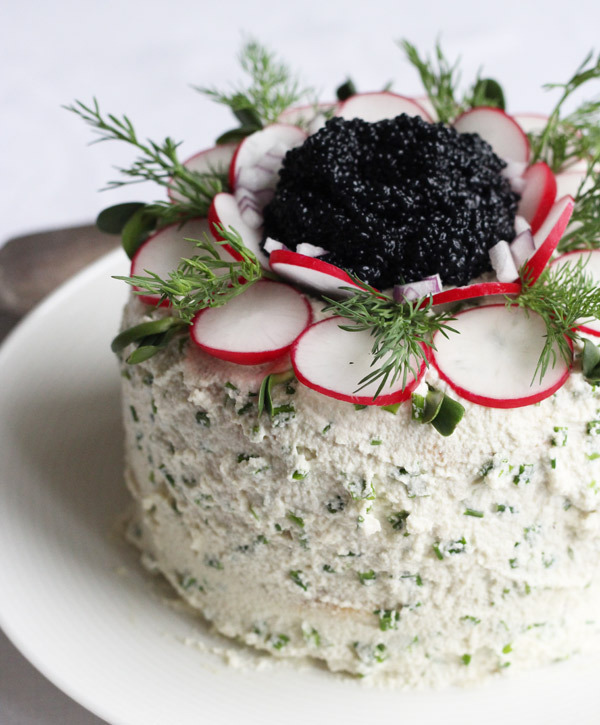 Decorate your cake prior to serving with thinly sliced radishes, seaweed caviar, dill etc. This looks so stylish and amazing!